At his home in Grants Pass, Oregon the man that created my favorite Disney comic to read as a child, passed away. He started at Disney in the mid Thirties and later went on to draw Donald and the gang well into the late Sixties. In his comics, the characters were dramatically different than the shorts. Donald was not near as much of a rascal and he took readers on adventures to exotic and exciting places way before Dr. Jones ever did. 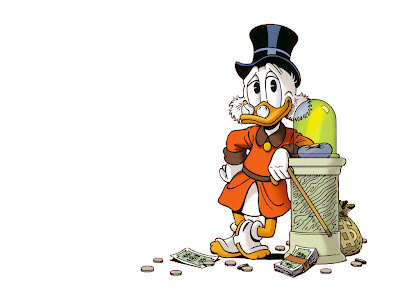 For an old man, he was mighty limber (Scrooge, not Barks). Carl did as Walt did, not creating stories for children, but the child in all of us. And I delighted in every issue he provided me. My love of adventure started with his words and pictures and I owe him a great deal of gratitude. Many youths of today will not even know him, but they do know of him through his creations. Disney really needs to bring some of the great Uncle Scrooge stories to the big screen, and not the lame Duck Tales. The way to do it is stay close to the comic stories as possible, I'm sure there's a way to translate it to movies. Forget the thousands of Marvel characters, Disney has a treasure trove of stories right here. And you've got a franchise 100 times better than Pirates of the Caribbean. Aw, I'm so sorry to read of his passing...when I first read his comics as a kid, I had no idea who he was, but my brother and I both called him "the GOOD artist" and loved his stories. My brother was usually scornful of funny-animal comics, being a solid Marvel man, although he would unbend sometimes to read Archie...but it was Uncle Scrooge that really impressed him. It's too bad that so many funny-animal or fantasy comics rely on gags alone. Barks and the immortal Floyd Gottfredson (and his Mickey Mouse comics) showed how adventurous and fun a duck and a mouse can be in the right hands. RIP, Mr. Barks. Carl Barks is absolutely brilliant. But why did you illustrate this post with a drawing by Don Rosa instead of one by Barks himself?